Gotta eat that throw, Juan. 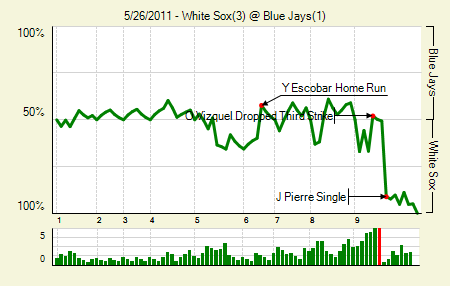 Moving the Needle: Juan Pierre singles, but Juan Rivera’s error costs the Jays, +.405 WPA. This is the kind of thing that probably wouldn’t happen if the Jays had an actual first baseman playing first. With runners on second and third in the top of the ninth, Pierre slapped one down the first base line. Rivera, playing behind the bag, fielded it cleanly, but clearly did not have a play on Pierre. Yet he still tossed it underhand to Marc Rzepczynski, who was running to cover. 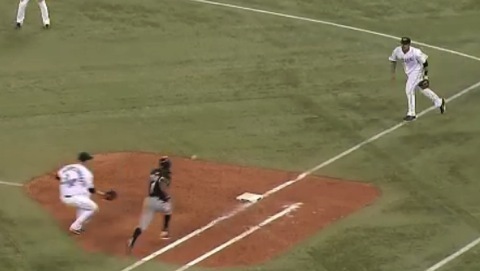 It was a bad throw, and it caused Rzepczynski to crash into the bag. More importantly for the game’s outcome, it caused the ball to roll away and allow the runner from second to score. That made it 3-1, and the Sox held on in the bottom half to win it. Brandon Morrow: 7 IP, 4 H, 1 R, 2 BB, 5 K. He ran into trouble from time to time, but he worked out of it. This was the first time he’s finished seven innings this season. Phil Humber: 7.2 IP, 6 H, 1 R, 1 BB, 3 K, 1 HR. The White Sox have six men in the rotation, and surprisingly Humber probably isn’t the guy who gets knocked to the pen when they pare down to five. Moving the Needle: Andy LaRoche doubles home a pair, +.191 WPA. After driving in a run in the second on a ground out, LaRoche came to the plate again in the fourth, with runners on first and third with two outs. This time he hit one down the third base line, and it went all the way into the corner. The hit allowed Mark Ellis to score from first, making it a 3-0 game. Cliff Pennington then singled to make it 4-0. As it turns out, the A’s would need those runs. Mark Trumbo: 1 for 4, 1 HR. With two on and two outs in the bottom of the ninth he took a Grant Balfour pitch for a ride. 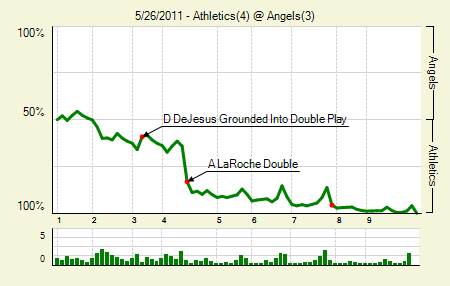 Unfortunately, that still left the Angels with a deficit. Balfour retired the next batter to complete the win. Brett Anderson: 8 IP, 3 H, 0 R, 3 BB, 4 K, 11 GB. He had just eclipsed the 100-pitch mark at the end of the eighth. Think he was a bit disappointed about not coming out for the ninth? Moving the Needle: Carlos Pena puts the Cubs ahead with a homer, +.201 WPA. The Mets took a lead in the third inning, but in the fourth the Cubs charged ahead. Pena got it started with a crisp, clean blast over the wall in right. The home run drove in two, giving the Cubs a 2-1 lead. They went on to score another pair in the inning before scattering another five runs the rest of the way. Kosuke Fukudome: 3 for 4, 1 HR, 1 BB. 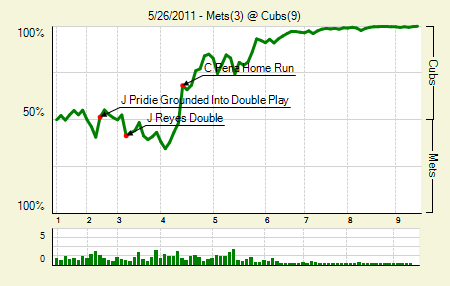 And there it is, his first home run of 2011. That he has just five extra base hits in 147 PA with a wOBA over .360 is quite, quite impressive. Jose Reyes: 2 for 4, 1 2B, 1 BB. A guy with that kind of speed and a .370+ OBP? He might only be a rental, but he surely can fetch the Mets something nice at the deadline if they choose to go down that path. 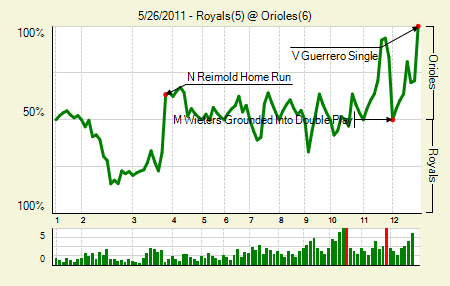 Moving the Needle: Matt Wieters ends the 11th with a double play, -.334 WPA. This is not what I’d call the defining moment of the game, but Moving the Needle describes the biggest WPA swing, and for the Orioles that came in the 11th when they loaded up the bases with none out. 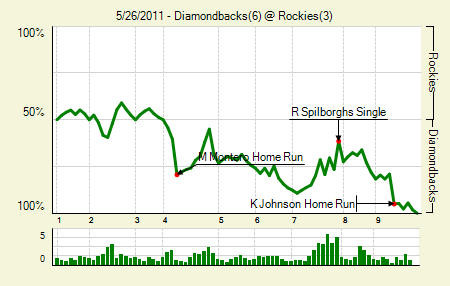 You know how a walk-off hit often isn’t the biggest WPA swing, because the home team was set up to score it? The Orioles were set up to win it here, so an inning-ending double play is obviously going to kill the WPA. I’ll save the biggest positive swing for the Notables section. Vladimir Guerrero supplied the walk-off hit, a bouncer up the middle. Nolan Reimold: 4 for 4, 1 2B, 2 HR, 1 BB. It’s been an eventful four games back for Reimold. He has 12 PA, and has homered in a quarter of them. Good to see he’s at work proving his 2010 was the anomaly. His three-run shot in the third gave the O’s a 5-4 lead. 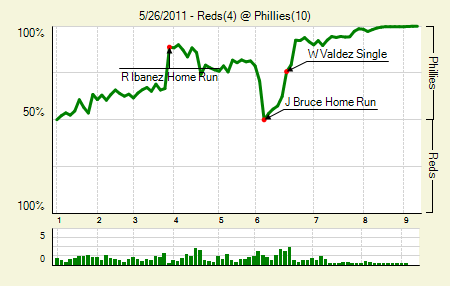 Moving the Needle: Raul Ibanez puts the Phils up big with a three-run homer, +.221 WPA. Never mind the Phils being tired after last night’s marathon. 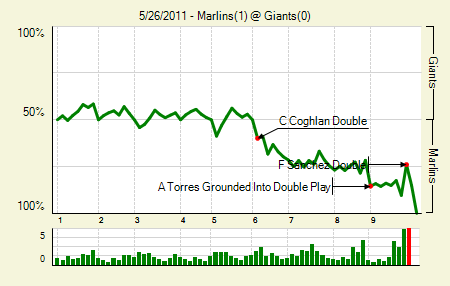 They picked up a run in the first, and then three more in the third when Ibanez went way deep to right. They continued the onslaught throughout the game, racking up six runs after the Reds tied it at four in the sixth. Cliff Lee: 8 IP, 10 H, 4 R, 1 BB, 8 K, 1 HR. OK, so it wasn’t Lee’s best outing. But at the plate he was 2 for 4 with a double and 3 RBI. So that kind of makes up for it, no? Chase Utley: 1 for 5, 1 HR. That’s just his second hit, first for extra bases, since returning earlier this week. Jay Bruce: 2 for 4, 1 HR. Clearly, Bruce is using his own Wonder Bat. Moving the Needle: Drew Sutton starts the party in the second with an RBI double, +.136 WPA. 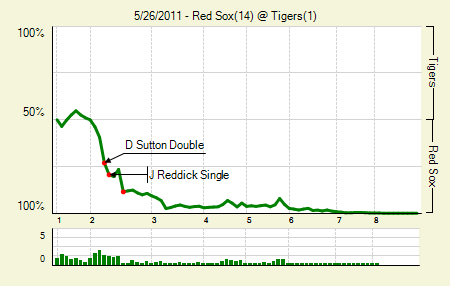 No, the Red Sox did not mercy rule the Tigers. The weather cut this one short, but that didn’t stop the Sox from piling it on. Sutton’s double in the second put the Sox on top, but a follow-up hit by Josh Reddick and, two batters later, a homer from Jacoby Ellsbury sent the Sox to a huge lead. There’s not much else to describe. Carl Crawford: 4 for 5, 2 3B. He didn’t get one in his breakout on Wednesday, so he doubled the effort yesterday. David Ortiz: 2 for 3, 1 2B, 2 BB. If there’s anyone on as big a hot streak as Crawford, it’s Ortiz. Alfredo Aceves: 6 IP, 5 H, 1 R, 2 BB, 6 K. You can’t ask for much more from a fill-in — though with Matsuzaka out for perhaps the rest of the year (who knows at this point? ), he could become a more permanent fixture in the Boston rotation. Moving the Needle: Freddy Sanchez starts a threat in the ninth, +.164 WPA. I’m really sorry about this one. I have no idea how the game’s only run — which was in a higher leverage spot than Sanchez’s — didn’t top the WPA board. In fact, it was just +.095, which just doesn’t seem to jibe with the preponderance of instances where the first run accounts for +10% or more to the win expectancy. In any case, Sanchez doubled with one out in the bottom of the ninth, with his team down by just one. Nothing came of it, as the final score indicates. But something did come of Logan Morrison’s single in the sixth. It brought home Chris Coghlan, which proved to be the difference. Anibal Sanchez: 9 IP, 5 H, 0 R, 2 BB, 8 K. That’s three scoreless appearances in his last four outings, which span 31 innings. Ryan Vogelsong: 8 IP, 8 H, 1 R, 1 BB, 3 K, 9 GB. It’s hard to not be impressed with what the journeyman has done so far this year, after having not pitched in the majors since 2006. Everything’s working, from the ground ball to the strikeouts to the lack of walks. Moving the Needle: Miguel Montero gets things started with a three-run homer, +.190 WPA. Leadoff walks can be killers. A leadoff walk followed by another walk? That’s just asking for a multi-run inning. Montero delivered three of them when he took Clay Mortensen out of the park and into the bullpen in the fourth inning. The Rockies would battle back, but they wouldn’t get close enough. Chris Young: 2 for 3, 1 2B, 1 BB. He’s fallen off a bit after a strong start, though he’s still hitting for power (.230 ISO and .230 BA). Kelly Johnson: 1 for 5, 1 HR. His two-run shot in the ninth provided insurance against a Rockies comeback. Unfortunately for Johnson, 2011 so far has been more 2009 than 2010. We hoped you liked reading The Morning After: Game Recaps for May 26th by Joe Pawlikowski! Bourn To Run Toward Big Contract? Phillies/Reds was 10-4 not 1-4.